Hispanic Heritage Day- Reds bench all their Hispanic players, will they be wearing Los Rojos shirts. Schumaker and Hannahan- just make it stop! Maybe the flu has hit the team and this is who is well. Last edited by klw; 09-07-2014 at 09:57 AM. Did Price address that he said he would use the call ups against non contenders, but then doesn't do it against the Mets? Also since July 9th Chris Heisey has had 18 starts...here are the same stats in Reds wins during that time. Neither are the answer as Luddy is a bit better but the sheer # of starts Skip gets is beyond perplexing and his stats that show how much he had contributed in Reds wins is hilarious. He does nothing and apparently has bad karma as well. I like him....but I don't get it. Good clubhouse guy and 17th inning pitcher. But...but ...but the Mets are only seven games out of the wild card. I won't be watching today. This is beyond stupid not playing any of the call ups and playing the Schu and Hannahan. 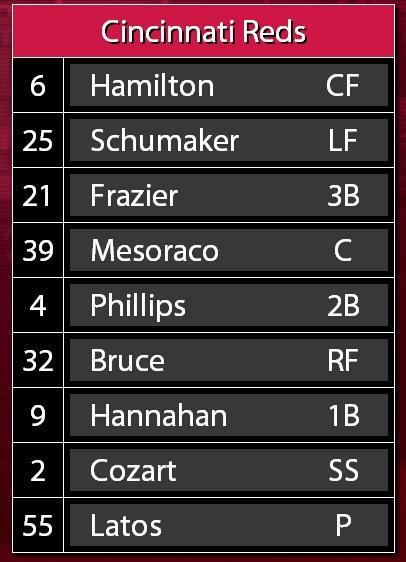 This lineup makes it a lot easier to not even flip over to the Reds game today, much less setting up a second screen to watch it. What do you mean the Mets aren't in contention? The Reds are in an absolute dog fight against the Mets right now. Draft status, and records are on the line here. They actually are in contention. Can anyone remember a Sunday game in recent years that wasn't televised? I sure can't. Of course, it may actually be a blessing with the way the Reds are playing, but I still love to watch baseball. Because Bengals opener? No idea but Reds rating would have to be better than a re showing of Kansas St football game. Last edited by klw; 09-07-2014 at 01:57 PM. 0-0 going to the 4th. Reds with no hits yet. 0-0 bottom 4 but Reds have them loaded an no outs. Philips GIDP to pitcher. 2nd and 3rd now with 2 outs. So we have Phillips, apparently playing hurt, getting hit by a pitch in the hand. Stays in game and hits a comebacker with bases loaded no outs. I'm not a big fan of playing September callups for the heck of it. But why Phillips is out there is absolutely beyond me.